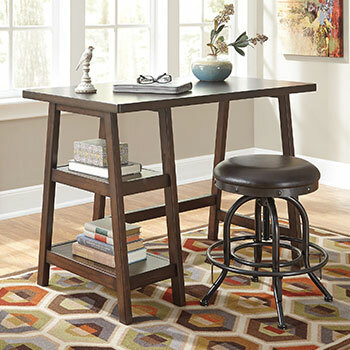 Whether you telecommute or need a dedicated study space to tap away at your computer, Roberts Furniture & Mattress is the Hampton Roads area’s premier discount source for quality home office furniture to make your job or homework time as efficient and comfortable as possible. Never settle for cheap kit furniture again! Find out for yourself how easily affordable fitting out your home workstation can be. We are proud to offer you warehouse-low prices every day on desks, tables, and credenzas that you will be glad to own and use as you productively spend your day. 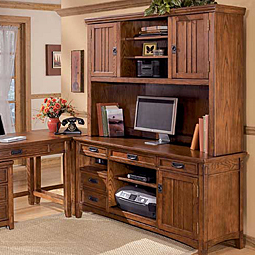 Our home office desks range from simple tables to park your laptop to units with hutches for all your storage needs. If you are sold on the notion of standing all day to work, to fight off the bad effect of sitting for hours at a computer, one of our adjustable-height home office desks is in order. If you are pressed for space, a bookshelf with desk return is just the thing for you. If your child needs a study nook in her room to keep on task, choose one of our fine wood hutch desks in the Hamilton/Franklin or Cottage Collection lines, for example. 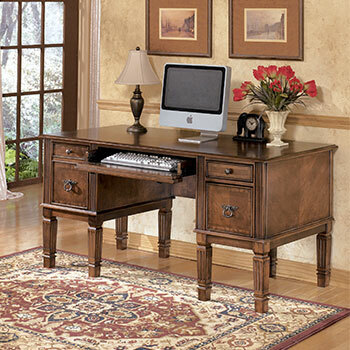 An L-shaped home office desk is optimal if your space has room to spread out, while one of our compact computer credenzas would be better if you might move your home office to another room, making moving it easier. For some people’s jobs, they don’t go to the office so much as people come to theirs. If you receive patients or clients at your home, we have a home office desk fit for the purpose while giving you all the work space you require. Choose from several fine traditional designs with impressive details and a rich, warm wood finish. Yes, you CAN have the home office you really want. 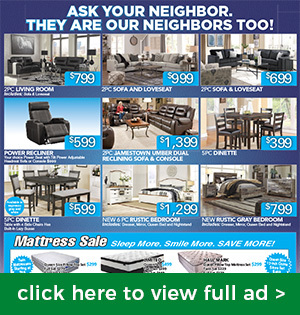 Stop by any of our five discount furniture stores including our store in Hampton, VA and we will make it happen.